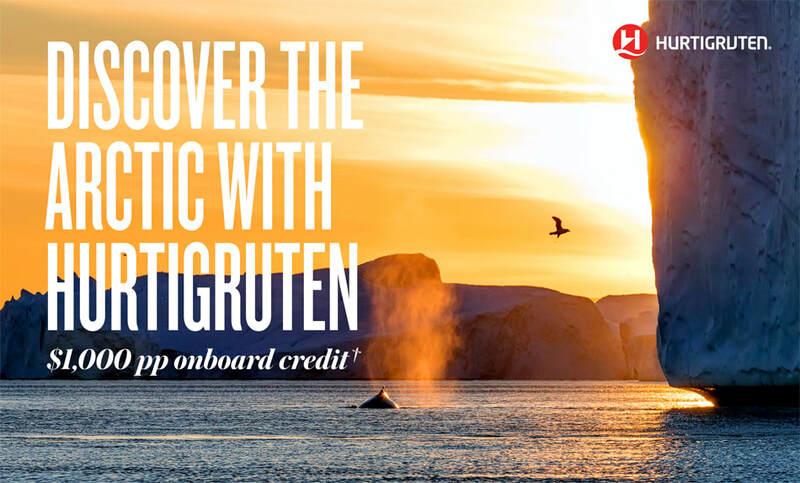 Discover The Arctic with Hurtigruten - Fugazi Travel Agency Inc. In Norwegian, the phrase 'hurtig ruten' translates to 'fast route'; it’s no wonder we chose this for our company name, after traveling along the Norwegian coast from Bergen to Kirkenes in just seven days—aboard a steamer ship in 1893, no less! Since then, for the past 125 years, we have expanded our offerings: from 6-day, 7-day, and 12-day cruises along the coast of Norway, to expeditions that travel all over the world, including Antarctica, Alaska, Iceland, and the Northwest Passage. *Prices are per person, based on double occupancy, in USD ($). All prices were accurate at the time of publication and are subject to change at any time at the discretion of Hurtigruten. Contact us for a specific fare quote as prices change frequently. †The onboard credit is given in Norwegian Kroner (NOK). 9,000 NOK is approximately $1,000 USD, depending on the exchange rate. The USD amount may fluctuate due to the current exchange rate. Guests who do not use the full amount of the onboard credit during their purchased sailing will not be refunded the remaining credit. This offer is valid for new, individual bookings only, for select departures, is capacity controlled, and subject to withdrawal at any time without notice. This offer cannot be combined with any other promotion except the Ambassador and Child offers. Other restrictions may apply. Offer is valid through May 31, 2019.